Students send evidence into the system and make claims for the evidence - what they think it proves they know and/or can do. Their student's assessor reviews the evidence and the claims the student has made for it. 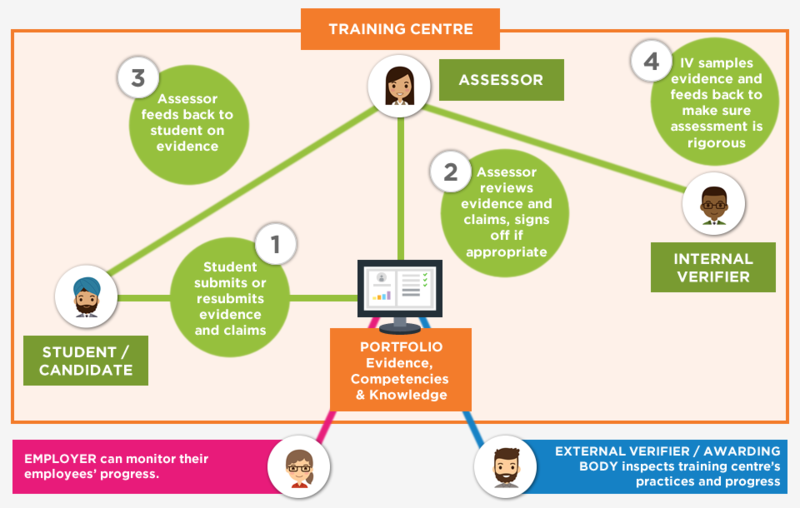 The assessor can accept or return the evidence and sign off claims to indicate that no more evidence is required for the competency/knowledge in question. When the student has met all the competencies and associated knowledge for the qualification, the portfolio is complete and the student has achieved their award. Motivational progress bars to show candidate % progress and optional flags to show them where they should be (see below). Monthly % progress record to show candidates who have begun to perform better or worse than their overall progress might suggest. Automated common knowledge mapping (knowledge claims and sign-offs are replicated across all units in which the same knowledge point exists). Assessment plans with due dates - for better candidate engagement and management. Contact Diary - complete audit trail of all communications/activities within the portfolio. Risk rating flags for assessors and administrators (see below). 'Previous Coverage' flags to help assessors make sign-off decisions. Evidence Matrix - shows claims for all evidence in any unit in the qualification. Reference materials repository for clients to populate. Editable disclaimers for student and assessor - no access until they agree. Crucial for GDPR. Employer and External Verifier access.